and whose message is now being revealed to the world." This type of newspaper article set the scene for the story to unfold of the Tomb and Curse of Tutankhamun to unfold. followed by gentlemen of the press." and hide around corners to surprise a secret out of us." The situation with the press came to a head when on 9 January 1923 Lord Carnarvon signed a £5,000 exclusive contract to cover the Tomb of Tutankhamun with the London Times. In addition to the exclusive rights he also negotiated 75% of all profits from the sale of Times articles to the rest of the world. The newspapers and the press media in general were furious about this monopoly on the news of the tomb of Tutankhamun. Reporters were forced to find different ways to cover the story, in addition to the original stories provided by the Times newspaper. Lord Carnarvon became ill in March 1923 when blood poisoning occurred after he nicked a mosquito bite with his cut-throat razor. On 5 April 1923 Lord Carnarvon died in Cairo of septicaemia, followed by pneumonia. Speculation about the curse increased. Newspapers reported that on the very time of his death all of the lights went out in Cairo for twenty minutes. It was also reported that at the very moment that Lord Carnarvon died his pet Fox Terrier dog, Susie, let out a loud howl and dropped dead at home in Highclere Castle in England. The Curse of King Tut ideas were fuelled by a novelist named Marie Corelli. Then, on the day that news of the death of Lord Carnarvon reached England the famous novelist Sir Arthur Conan Doyle was being interviewed by a newspaper reporter from the Times. When the reporter mentioned the death of Lord Carnarvon Sir Arthur Conan Doyle repeated his views that the death could have been of a result of "elementals" or "curses" created by ancient priests to guard the tomb of King Tut. The story made headlines in newspapers the world over. 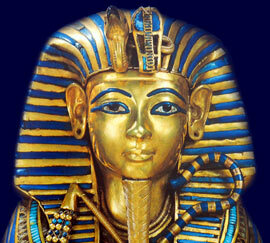 Ideas about the "Curse of King Tut" continued to be published. Myths and legends about deaths, curses and mummies were both fun and frightening. "Those most intimately connected with [the tomb] during the last few months suffered in some way or other. Even the journalists who covered the story have felt the reaction. Three of them have been ill…"
A strange coincidence was also reported when the mummy of Pharaoh Tutankhamun was unwrapped. The mummy was found to have a wound on the left cheek. The wound was in the exact same position as the mosquito bite which had led to the death of Lord Carnarvon. Each section of the website addresses all topics and provides interesting facts and information about the Golden Age of Pharaohs and of Egypt. The Sitemap provides full details of all of the information and facts provided about the fascinating subject of the Pharaoh Tutankhamun and the role of the Newspapers in the legends and myths surrounding the Curse of King Tut.